I am Sausal Creek. I have been flowing for a very, very long time. If you sit quietly upon my banks, you can hear my water rippling. If you listen carefully, you can hear my story. Soy el Arroyo Sausal. He estado fluyendo por mucho, mucho tiempo. Si te sientas silenciosamente a mis orillas, puedes oir el ondear de mis aguas. Si escucha cuidadosamente, puedes escuchar mi historia. Although Muñoz’s Spanish translation captures the written poetic musicality of the English, there are some typos (“escucha” should be “escuchas,” for instance), and some alternatives—such as “si te sientas en silencio” rather than “si te sientas silenciosamente” and “si escuchas bien” rather than “si escuchas cuidadosamente”—might make more sense to hablantes. But either way, the Spanish allows for young readers to follow in both languages. 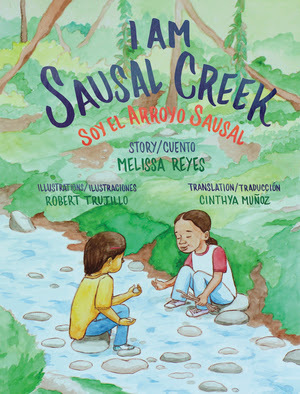 Generally, with a picture book, there has to be a narrow focus; and I Am Sausal Creek / Soy el Arroyo Sausal focuses on the environmental destruction and rebuilding of one particular watershed. Here, I like the approach of nature’s being the witness; at the same time, I would like to have had Reyes address—in the text—the human cost as well. To their credit, Reyes and Muñoz pack six pages of historical information (three in English and three in Spanish) into the back matter, so that educators can choose to expand the story. Young children have the ability to understand complexities, and relate historical and contemporary events such as racism, land theft and even genocide to their own lives. I recommend that educators read and digest Deborah A. Miranda’s Bad Indians: A Tribal Memoir (Heyday, 2013), and visit her blog as well (badndns.blogspot.com). I also recommend, for children, Simon Ortiz’s stunning picture book, The People Shall Continue (Children’s Book Press, 1994). It’s an overview of the histories of Indian peoples in this land, and could be read together with I Am Sausal Creek / Soy el Arroyo Sausal. With supporting materials, I Am Sausal Creek/ Soy el Arroyo Sausal is a promising debut, and is highly recommended. Thank you to Oralia Garza de Cortes and Lyn Miller-Lachmann. I´m a 4th grade-spanish teacher and my last investigation is about Sausal Creek in Oakland. Can you tell me as soon is posible whe can I faund it or if it´s posible to view it on line. Hi, Estela. Thanks for writing. You can purchase this excellent book from Nomad Press in Oakland, or ask your local bookstore to order it for you. This was a duplicate comment and was removed.